Cambodia and Siem Reap - these words conjure up images of Angkor Wat, the largest temple complex and religious monument in the whole world. Angkor wat roughly translates to the City of Temples (Angkor derived from the Sanskrit word 'Nagara' and Wat from the Sanskrit word 'Vaat' meaning 'an enclosure') and was originally constructed as a Hindu temple by King Suryavarman II of the Khmer dynasty. 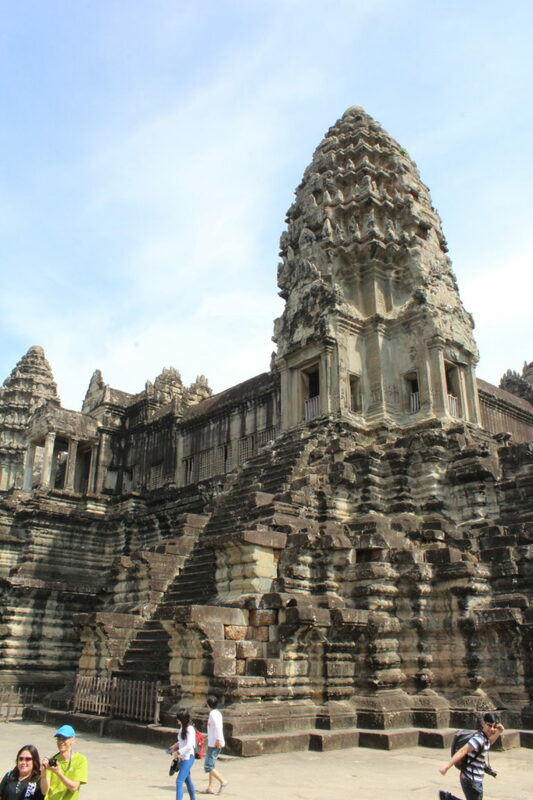 Unlike most other Angkor temples, this is a West-facing temple built in the early 12th century and was dedicated to Lord Vishnu till the end of the century, when it gradually and gently was converted to Theravada Buddhism. Today, the temple is a symbol of national pride in Cambodia and finds a central place on its flag, representing Religion (Buddhism). 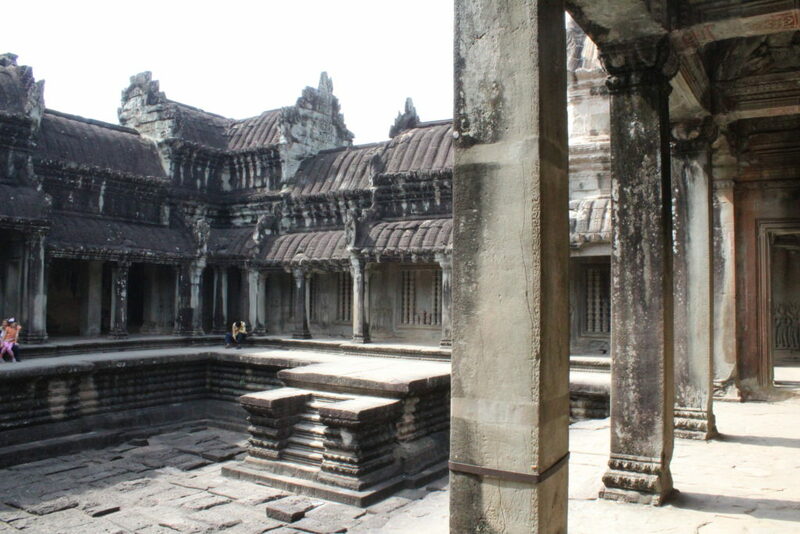 It is a classic example of the Khmer architecture, carved in sandstone and known for its sheer size. It is a monumental complex spread across 402 acres, and is well-known for its extensive bas reliefs portraying devatas (gods) and apasaras (heavenly nymphs) on its walls. It is also famed for the harmony and proportions of its architecture with a central sanctum sanctorum enclosed by a concentric galleries separated by courtyards in between. These galleries are interspersed with gopurams at cardinal intervals, which are nothing but elaborately carved entrances, flanked by dwarpalakas or guards on each side. Reach the five towers representing the mountain residences of Gods. Out of which, the central tower represents Mount Meru, the holy abode of Gods, atop which one is supposed to attain Nirvana! We landed at Siem Reap on a fine Saturday afternoon and had 4 full days to roam around and absorb what the city had to offer. The first thing that struck us when we landed was the warm and welcoming hospitality of its people. Inspite of the visible poverty around, the people are super nice and sweet. The road from the airport to our villa reminded me of how India used to be in the 90s - small shops and eateries on both sides of the road; a river canal flowing through the city, muddy side paths; crowded streets, hawkers selling their wares on carts and tourists everywhere. The nostalgia felt inviting, and true to my vibes, we found it to be a clean, tourist-friendly and happening city at any time of the day! Would like to mention that Pub Street is another such happening street which is quite close to the Old Market and the Night Market. 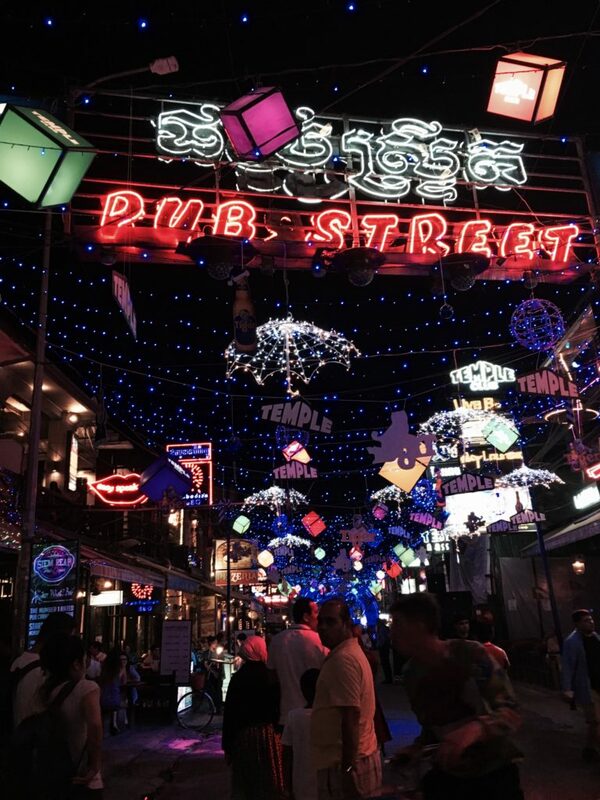 It won't be an overstatement to call it the most lively street in entire Siem Reap. It's full of restaurants, massage spas, bars with live bands and night clubs. The food options are really good and so are the shops selling knock offs. You get most things under $5! It's the apt place to unwind at night by taking a foot massage and having a warm dinner after spending the entire day wandering the temples. 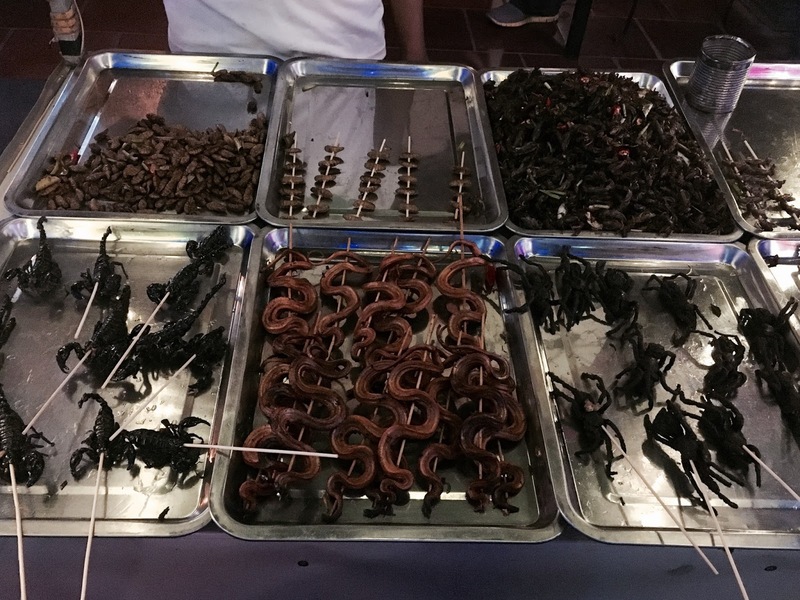 Right here on Pub Street, we found this vendor selling fried tarantulas and other such weird local delicacies. As he hardly had any tourists buying from him, he charged us a dollar to click pictures from his cart..it had all sorts of crawling creatures that one can imagine! Before we started visiting the temples, we visited the Angkor National Museum. This is a must-do 2 hours to understand the Khmer history and its transition from Hinduism to Buddhism. The museum houses numerous artifacts including the 1000 Buddhas and many Hindu deities. Sadly, many of the artifacts are in a damaged condition (eg: We saw many headless Buddhas- The eyes of these Buddhas, embedded with precious gems were looted by beheading these sculptures) pointing out to the untold pillage and plunder that this country underwent till as recent as 1993. We had bought 3-day passes of Angkor Archaeological Park. One day is not enough time to witness the past grandeur of the Khmer dynasty, so it is advisable to buy the 3-day passes beforehand. We had rented a tuk-tuk and a local guide for our sightseeing and off we started with Angkor Wat. As we neared the entrance, I saw a big lake on the way to the temple. I was mistaken. It wasn't a lake but the mighty moat that surrounded the complex. On we proceeded and this was our first glimpse of the sprawling temple complex (pic below). I was excited! We crossed the gate and started walking towards the main temple. It is recommended to enter from the East Gate to avoid the crowds at the West Gate. We crossed this second enclosure and reached the area where the temple towers stand tall staring down at us. Some towers were under renovation and they are closed to public on certain days to allow for cleaning and maintenance. From the third enclosure, we spotted the ancient east-west facing library where the walls have inscriptions on them. Crossing this enclosure led us towards the central and the main tower which used to house the presiding deity of the temple. As we move along inside the temple, we find most of the spaces quite bare and empty. Gone are the bejewelled deities and gone are the riches that once adorned these now empty nooks and corners of this temple. 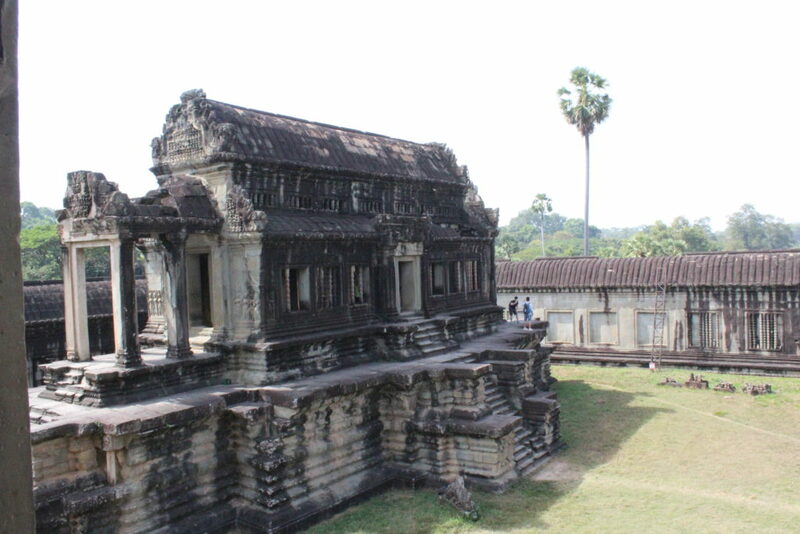 Most of the artifacts are looted and the remaining ones are now preserved in the Phnom Penh Musuem and the Angkor National Musuem. We soon reached the West Gate which is usually the main entrance to the temple.The path towards the West Gate is adorned with various nagas and lions guarding the gates. Now it also crowded with various shops selling local goods. Not to mention the weirdest of food options the local people indulge in! This temple was once taken over by the dense forests around it. This might be the reason that it was protected during the Khmer Rouge and the genocide that this country witnessed. The treasures of these temples are long gone but what remains behind is nothing less than a marvel - a mathematical and an archaeological marvel. 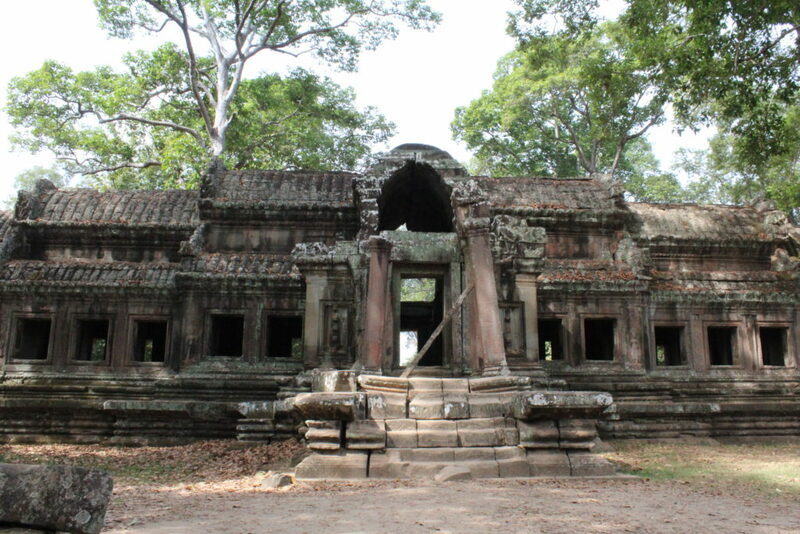 The next temple we visited that day was the Ta Prohm temple. It was CRAZILY crowded on that particular afternoon! 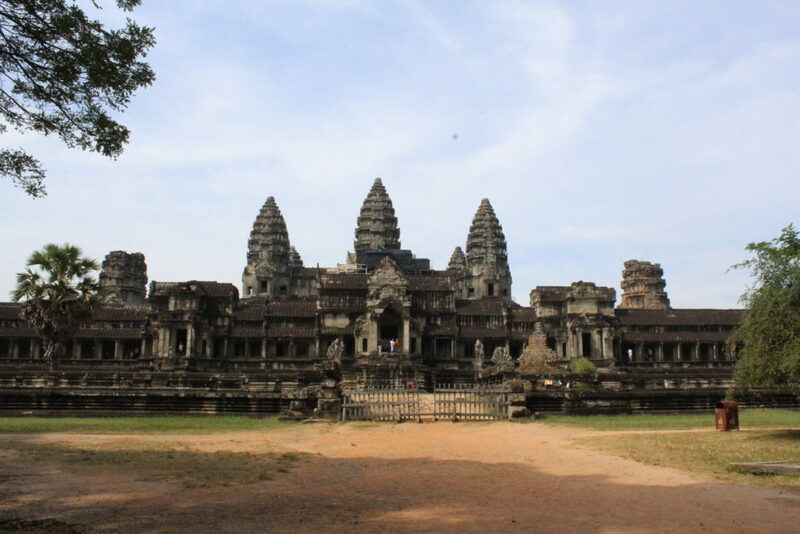 It is one of Angkor's most popular temples with visitors. The reason might be because this was the location for the popular Hollywood movie Tomb Raider. Or most probably because of the picturesque vistas this temple offers after merging with the forests around. Yes! The trees growing out of its ruins are perhaps its most distinguishing and eerie feature at the same time. 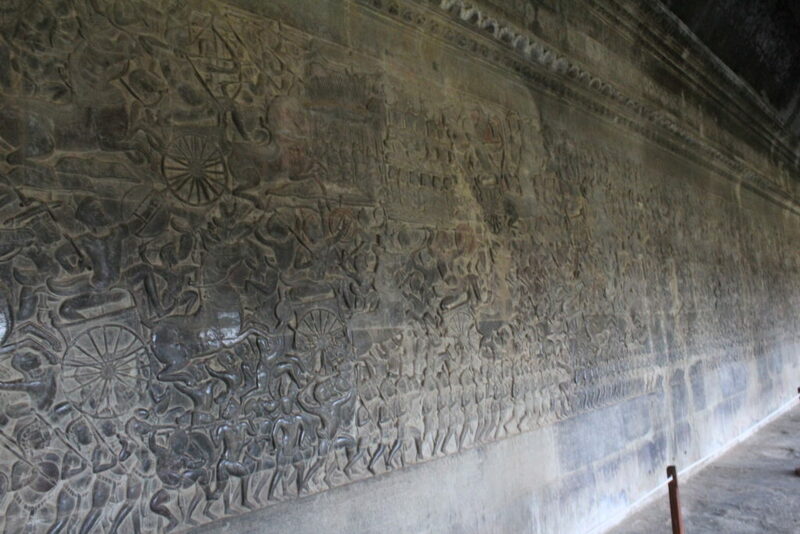 This temple was constructed again by Jayavarman VII as a Buddhist monastery and university. Now the temple is in a dilapidated state. 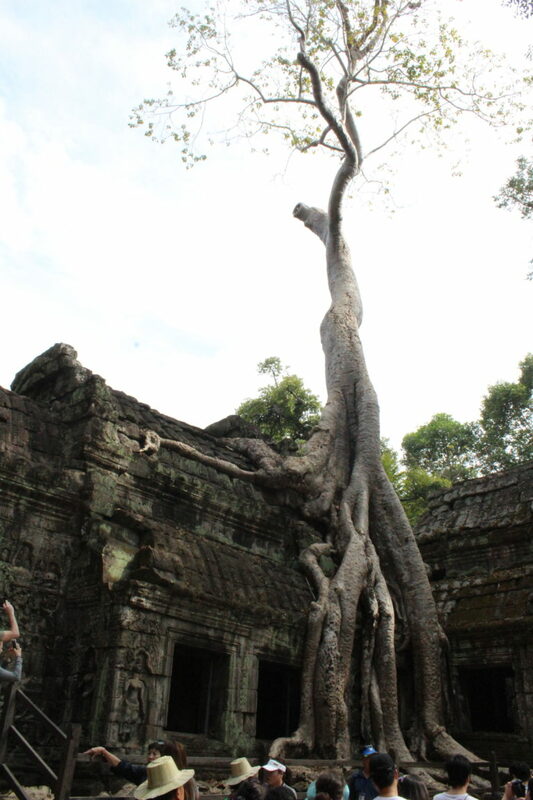 However, the conservation and restoration of Ta Prohm is jointly undertaken by our Archaeological Survey of India (ASI) and the APSARA (Authority for the Protection and Management of Angkor and the Region of Siem Reap). 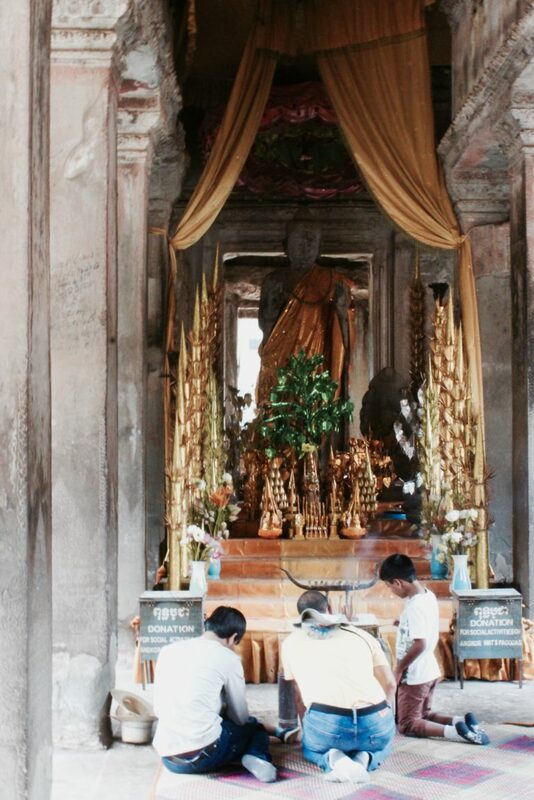 A must-see temple on your list when you are in Siem Reap. Not much left to see in terms of carvings but it is fascinating to see how nature is taking over this marvellous piece of art. Just try not to go before lunch time to avoid the crowds. It was around 3 pm and we were already tired with the all the walking we had to do in the humid weather. However, we could not afford to miss Angkor Thom! Angkor Thom or the "Great City" is a walled city in Siem Reap which used to house the royal palace, numerous official residences and temples within its boundary. It was built in almost a perfect square and covers a large area of 12km in length and breadth alike, with a moat built around it. 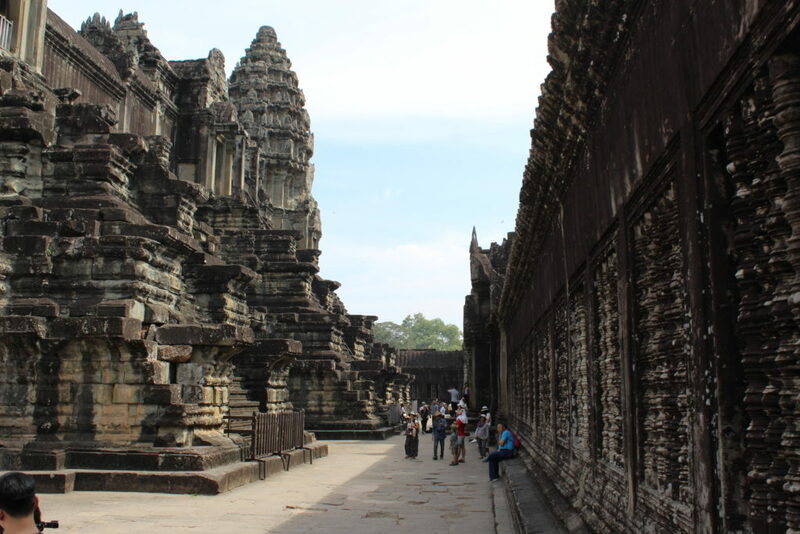 This fortified city was built by Jayavarman VII and was the capital to a population of around 1 million. Not much is left of the City today except the enclosure walls with towers and a few noteworthy temples and monuments including the famous Bayon Temple. Bayon temple is situated exactly in the centre of this walled city. 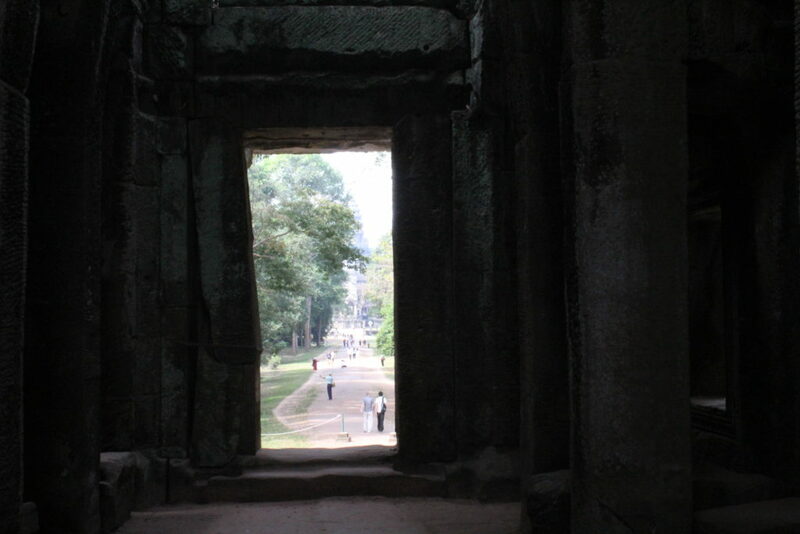 It represents the intersection between heaven and earth in the cosmic Universe which is represented by Angkor Thom. 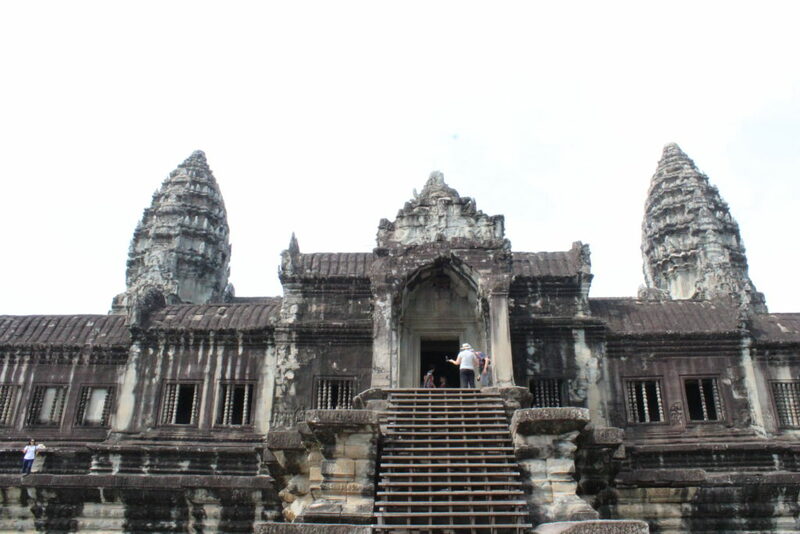 It was the last <strong>State Temple</strong> of Angkor and was originally named Jayagiri. The name later got changed to "Banyan Temple" and now the mispronounced name of "Bayon' is stuck with it. The beauty of this temple lies in the fact that it appears to be a stony mass of chaos like a misfit jigsaw, towering into the sky from a distance but as we go closer, we see the serene and smiling faces carved on the 54 towers of this temple. 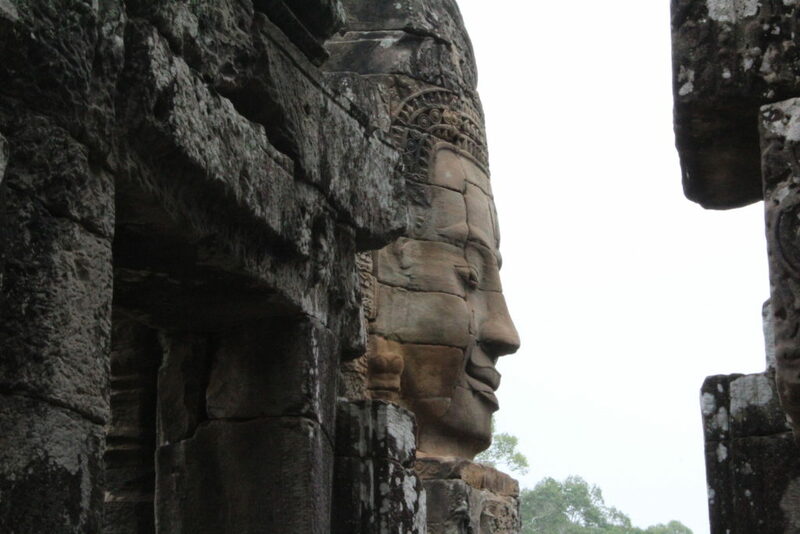 All the 216 faces are carved on the upper part of its towers and are said to be of the King (Jayavarman VII) himself. Some also believe it to be that of Avalokiteshwara. The Bayon temple is a baroque gem of the Khmer empire, quite in contrast to the classical architectural marvel that is Angkor Wat. There are many such impressive architectural masterpieces strewn all over this ancient capital city of the Khmer dynasty. <strong>Banteay Srei temple, Kulen mountain, 1000 shivalingas</strong> on a river bed and many others in this temple city are worth a visit. Take your own time and leisurely wander these ancient ruins with a local guide by your side. 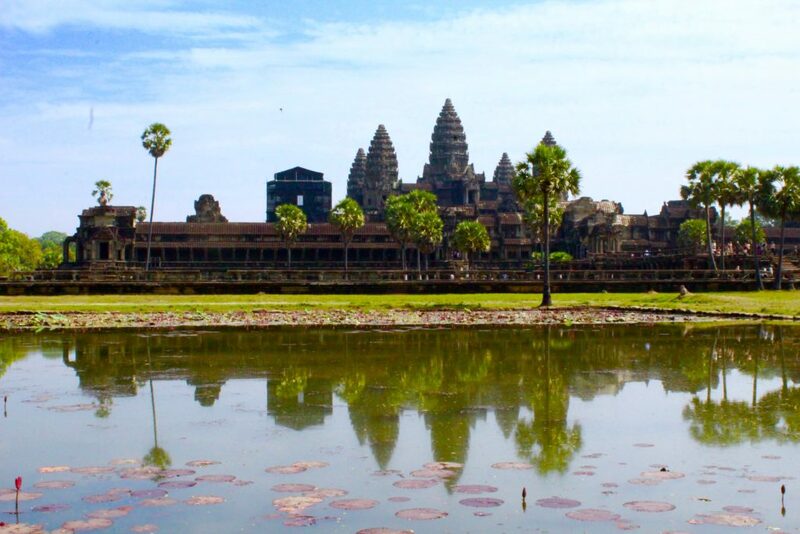 Therein lies the true charm of visiting Siem Reap and exploring its rich and golden history. Buy a sim card for your phone at the Siem Reap airport itself. Cell card offers good data and mobile coverage under $10. We had rented a villa through Airbnb. It was quite a comfortable accommodation with the owner arranging for all the tours and guides, including airport pick up and drop. Vegetarian food options are limited but available nonetheless. Peace Cafe (River Road 172, Bang Don Pa) is one such vegetarian cafe which offers both local and continental food in a relaxing setting. The Cafe offers yoga and meditation classes as well for those interested. Viva Restaurant - 697 Street 09, Krong Siem Reap, Cambodia: Lovely Mexican food right next to the Old Market. Dakshin's - Old Market,Opp Siem Reap Referral Hospital, Siem Reap 0000, Cambodia: Authentic Indian snacks and thalis for those missing Indian food.